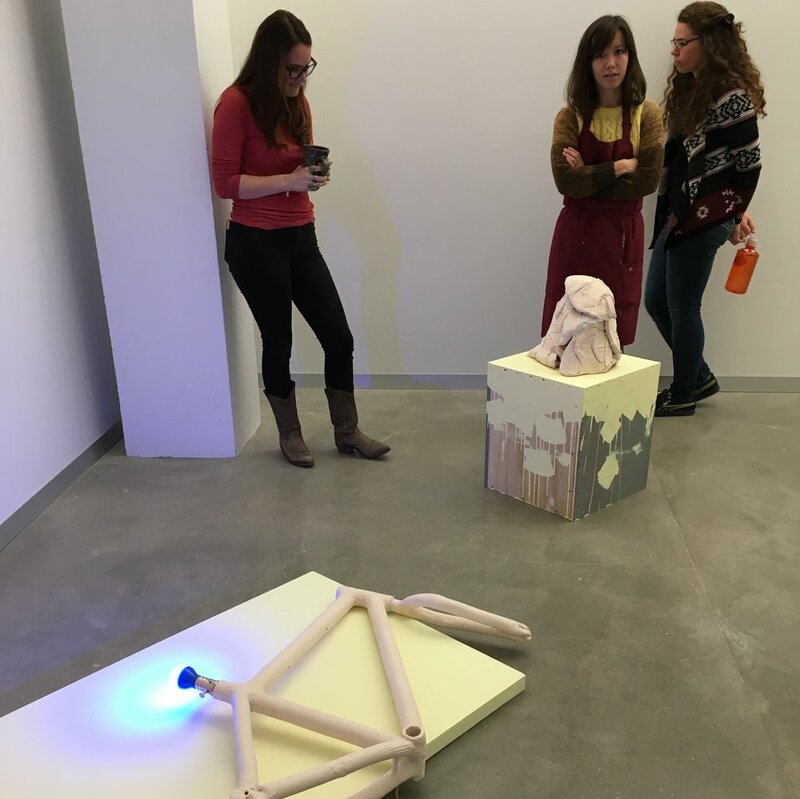 As a graduate student, you are the occupant and owner of a studio within the graduate ceramics studio for three years, or as long as you are enrolled. It’s possible that at times others may join you, such as adjunct faculty, visiting artists, and occasional advanced BFAs when space requires. Cleaning it is recommended. Seriously. Messy spaces equal messy work, no room to make your work, and no way to find your work. We have limited space, and if it’s cluttered with abandoned projects, old pizza boxes, and your own personal stash of site-specific objects, you’ll be frustrated. Ultimately it’s your preference and responsibility to keep the kind of space that fosters your creativity the best. If that’s utter chaos, we can try to be hospitable as long as it doesn’t infringe on your neighbor’s health or space. Each grad space has an 8 foot long shelf, 8 foot long table, and locking cabinet assigned to it. There are other tables around, and other equipment you can keep in your space. There should be enough wheels for one to live in your space if needed, and there are also tools that generally stay in the grad space, like a smaller slab roller, pneumatic extruder, and an air-powered 3d ceramic printer. These are for the group to use, but if one person needs one exclusively and it’s fine with everyone else, it’s ok for it to have an extended stay in that person’s space. Your space is your home. Nurture it, constantly re-evaluate it, make it yours. You should find ways to make it an efficient environment for the creation of your work, and we're happy to help you customize it. It should be the place you want to be more than anywhere else while you're here. Try everything you can during your first year - it's a great opportunity for exploration, and you'll have significantly less pressure than later on. In year two, try to evaluate what worked well and what didn't during your first year. Critically assess your efforts, and narrow your focus to a few ideas and techniques worthy of deep studio time. Year three needs to be full-tilt focussed effort toward your MFA show. You should know what your work is about, how to make it well, and be able to execute a museum quality solo exhibition by spring semester. You will be surrounded by close to 100 other Studio and Art History graduates at any given time during your tenure here, as well as some 40-odd faculty members, lab supervisors, and other support staff. No one person has all the answers you need, and you should cast as wide a net as possible as you search for advice, feedback, and friendship with your colleagues. Find ways to interact with these people - ask for studio visits as much as possible, and collaborate with your peers. Every area in the Art school has it's own graduate level workshop course, which is generally a time for loosely structured group critique. Take as many other areas' workshops as possible - particularly those in 2D, if you're a 3D person. You'll be amazed at the suggestions they offer. Start keeping an eye out for committee members early. If you like a faculty member's work, or hear good things about them, find a way to meet them and get to know them - early. The more input you can get from your committee members, the better. They will all be willing to meet with you as much as is helpful - but it's your job to initiate those interactions. We're all quite busy of course, but we want to make time for you. We aren't likely to always seek you out, so make sure you take the initiative to get as much from your faculty as possible. We expect that of you. Give and get from your direct peers. The people around you most will be your friends and colleagues for the rest of your life. Treat them with respect, and help them when they need it. Talk about your work, and theirs, with honesty and curiosity. You have a responsibility to them, and they have the same to you - each of you only gets so many people to be in grad school with. Don't be dead weight - someone not working, not striving, and not focussed not only lets down themselves, but also their peers. If someone around you is slacking, call them out - tell them you expect more of them, and that you're here to help them get back on track. Just going home and hanging out at your parents' house is a waste of valuable time. Treat each summer like a residency opportunity. Go somewhere where you can get input from others outside of this place. If you don't have luck applying to residency programs, make one for yourself. Travel with friends, see art, make art anywhere you can. If you treat the summers like extra studio time away from courses, you'll be even more productive when you come back. Places that have been great for students have been Watershed, Haystack, The Archie Bray Foundation, Anderson Ranch, Penland, The Vermont Studio Center, Grin City Collective, The Norther Clay Center, The Clay Studio of Philadelphia, Harvard Ceramics, Arrowmont, Taos Clay, Greenwich House Pottery, Medalta, AIR Vallauris, CRETA Rome, The European Ceramic Work Centre, The International Ceramic Studio at Keskamet, Guldagergaard in Denmark, Red Lodge Clay Center, The Clay Studio of Missoula, Ox-Bow, etc, etc, etc... There are grants, particularly through the graduate college, for summer travel, and in many cases you can get these opportunities completely funded if you work hard enough in advance. This is an incredible community of scholars from all over the world. There are resources available to you as a student at this university that you'll never have access to again in your life - make them count! Any peripheral interest you have, such that it informs your work, can be researched, informed, and investigated with the help of experts. Your elective course options in the curriculum are excellent ways to capitalize on these resources, but even if you don't have room to take a course in an area, find out what's available on campus and figure out a way to make use of it. The University library and special collections are also tremendous resources, containing many priceless artifacts and archives of art related materials. A visit to the special collections area of the main library is well worth your time. Furthermore, the University of Iowa Museum of Art will soon have a new building, and contains one of the premier university art collections in the country. Visit the temporary exhibits and exhibition spaces in the mean time, and get to know museum staff members if you can. It's worth it to ask to take your class to see ancient african ceramic artifacts in the collection, or to arrange a special visit to the university ceramics collection to handle works by many 20th century masters. Many people might tell you not to spend your time exhibiting work externally in graduate school so as not to be distracted from your work. Without some external exhibitions on your CV however, you'll feel deficient when you leave, and you'll spend extra time then building up your resume to be considered for jobs and opportunities. It's fine to exhibit work that winds up looking outdated later - no one will remember. If they do, then you've made enough of an impact to net you opportunities, and that's a great thing. International juried exhibitions are surprisingly easy to get into as an artist from the US - give them a shot in particular. Rarely does anyone look to see where you exhibited work in Rome... it could be a closet in a bakery, and it would still sound impressive on your CV. It can be tempting to take every course that sounds interesting - be wary of those that are extremely process heavy, and if you choose them, make sure they relate directly to what you need in your existing body of work. If you don't plan to use metal, there's little reason to spend a semester in hot metal casting, because it will rule your existence. This isn't to say those courses aren't extremely valuable and GREAT to take if they make sense for you... but if it's just a tangential interest for you, save it for another time in life. You're here to make the best work you can, and you need to guard your studio time preciously. You will be amazed at the number of distractions available to you - everyone loves to have partners in procrastination. Don't get sidetracked. Your three years will be over before you know it, and if you spend all your time at George's, you'll wind up well-qualified for a life as an Iowa City bartender. There are worse things to do with your time of course, but you're here to make work. Make a schedule that works for you, and stick to it. If you need privacy, become nocturnal, and get work done when others sleep. Our graduate space is open and communal - wear headphones if you don't want to be bothered. It's a great signal to others that you're in your own space and focussed. Try to be the first one here and the last one to leave - and pat yourself on the back when it's just you and the 3rd shift janitors in the building. As mentioned above, you are surrounded by accomplished artists and faculty members - 40 of them. You should use them as much as possible to help you. It's totally normal for grad students to ask for critiques or seek feedback from faculty in other areas. We enjoy this! Beginning to ask for advice early helps you form relationships with a diverse faculty cohort, and affords you time to build a long running dialogue - something that you can't really do later on in your time in school. Look at the faculty's work, find people who you think may have things in common with you, and ask for a studio visit. These can be priceless interactions, but they only happen if you initiate them. Most people are nervous when they start teaching. Having a teaching assistantship sounds great on paper - tuition waiver, a stipend, insurance... sign me up, right? Except when you realize you need a syllabus, and that you'll be the person in front of the room of staring silent eyes on the first day of class. Good news - odds are you already know how to do this. Think about the best teachers you've had... and pretend to be them. Most often, you related to them because you saw a part of their humanity that resonated with you. They probably didn't have it all together - they might have shown up late, wore weird clothes, or went on ridiculous tangents. Probably you enjoyed those things though. That's called being yourself... and you can do it too. We try to make the transition from student to graduate instructor of record as easy as possible for you. In almost every case, a new graduate student (or an experienced one for that matter) teaches Ceramics 1 (we call it Forms in Clay 1 - but same thing). That means for starters you already know more than anyone in the room, even if you don't feel like you do. Take time to get to class early when you can - look in the mirror and make sure nothing is in your teeth, and know what you're doing in class before you arrive. The good thing about studio courses is that we spend a lot of time with students while they make work, which means you don't need a prepared lecture for every class period. It's fine to have fun with them, and keep things laid back. We also work off a shared syllabus for all intro Ceramics classes. There are five assignments during the semester, and three of them will be the same for all classes. That way you have the ability to invent a couple of projects on your own, and simultaneously don't have to come up with an entire syllabus yourself two days after you move to town. We have a shared dropbox folder for assignment evaluations and anything else that makes sense to circulate, and we'll have a clay making schedule for all the classes to keep things organized. There's actually not that much prep or planning you need to do on your own, and after a few days at it, it will all seem very normal, and hopefully, fun. It's helpful to have an idea of who to go to for your needs here, and to have a degree of understanding about the organizational structure of the school. Steve McGuire, Interim Director of The School of Art and Art History, and Professor of Art. Steve is a mentor to many of us, and has been part of the university community for many years, having earned his MFA and PhD degrees here in Sculpture and Art Education. He is an avid titanium bicycle builder and rider, and has biked a portion of the Iditarod trail in Alaska as well as numerous other endurance bike events around the country. He cares deeply about the success of the Art program, and has been a great friend to Ceramics over the years. He's happy to take time to get to know you, speak with you, and be on your committee, and presently teaches the hand-built bike building course here in the school. Laura Jorgensen is the graduate secretary. She is extremely helpful, and will do anything she can to answer your questions and make sure you graduate on time. She's a tireless worker on behalf of the students here, and you should get to know her right away. Andrew Casto - head of the Ceramics area and an Assistant Professor of Art. Troy handles contracts, keys, does some scheduling of meetings for the DEO, and in general works between SAAH and the College. Kevin is who you go to for reimbursements, paycheck questions, and advice about motorcycles. Adam is a great resource for any question in the woodshop, and has an MFA in sculpture. He's kind and patient, and always happy to help you make good (safe) decisions about your work. He's done some work in ceramics as well and understands our processes. Ben was the former Metals tech, and currently handles all safety compliance issues for SAAH. If you need advice on hanging something, or want to know what limits can be pushed, he's the right person to talk to. Tony is a master mold maker and fabrication technician. He runs the foundry, and in general knows a tremendous amount about 3D art making techniques. He's also very helpful, patient, and happy to assist with whatever you need.